This is the twelfth post in the Around the World Birthday Extravaganza Series. Please scroll to the bottom to see all the other posts in this series. It was the year 1855. Paris was hosting Exposition Universelle, a huge exhibition held on the Champs Elysees showcasing art from artists all around the world. At the expo, Emperor Napolean III wanted to display the wines of Bordeaux, one of the most well-known wine-producing regions in France. He requested that a classification system be created, asking wine brokers to rank the wines. The top wines would be called Premier Cru, or first growths. It would go down from there to the fifth growths. Only four wines received the coveted honor of Premier Cru: Château Latour, Château Lafite Rothschild, Château Margaux, and Château Haut-Brion. Our goal in Bordeaux was to visit as many of these top wineries (first or second growth) as possible. We soon learned that many of the top wineries do not give public tours. You have to be a person who works in the wine industry. The places that did offer tours to the public were quite selective. One winery asked us to describe our knowledge and appreciation of their wines before agreeing to host us. Another winery charged quite a bit of money for the tour and tasting. This is why our first visit to Château Haut-Brion was so special. It was the only first growth winery that was willing to let us visit. We had to make an appointment for a private tour in English, but the tour was free. Best yet, it included a tasting of two (!) of their (insanely expensive) wines. Here’s a quick peek at their stainless steel fermentation tanks. This is where grapes go after they are de-stemmed and crushed. Through the use of gravity only, the grapes go through a two-step fermentation process, with fermentation at the top of the tank and malolactic fermentation occurring at the bottom. 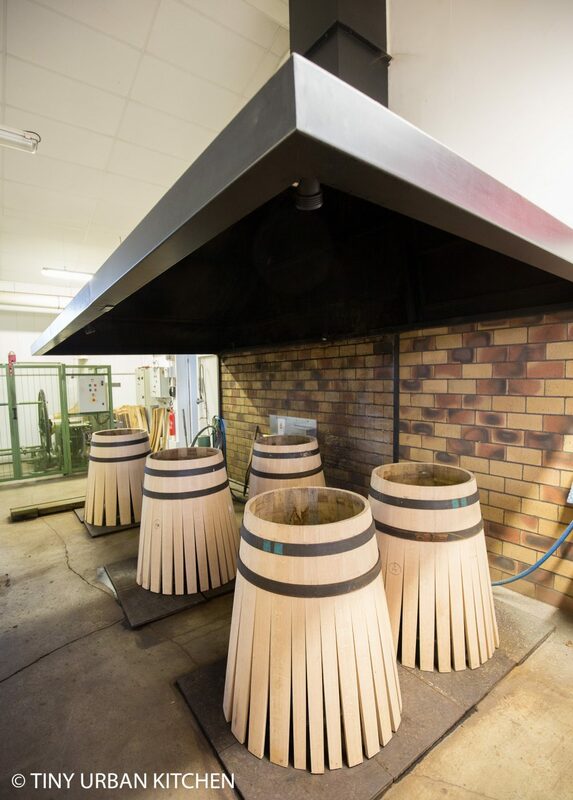 Once the two step fermentation process is complete, the wines are aged in oak barrels up to 18 months. Château Haut-Brion is unique is that they make their own oak barrels. We visited many wineries in Bordeaux, but this was the only one that had its own cooperage (a barrel maker). Finally, our last stop was the tasting room. It was unreal to see so many bottles (of all different sizes!) of such a highly-respected wine. We were thrilled to sample TWO different wines that day. A 2007 Château Haut-Brion (~$500 USD value) and a 2007 Château La Mission Haut-Brion (~$200 value). It was most certainly a treat to try such sought-after wines. Surprisingly, several of us (me included) preferred the 2007 Château La Mission Haut-Brion. Perhaps it was a better vintage. In any event, it was really interesting to try both. The tour took less than two hours. We didn’t have much time to walk around the grounds, but I did snap a few photos. This winery is conveniently located very close to downtown Bordeaux. We took a taxi out there and it was only about a 10-15 minute drive. Traffic can get hairy in Bordeaux, though, so plan for a much longer drive if you are traveling during rush hour. Make sure to keep the phone number of a cab company handy, because the vineyard is far enough out that there will be no taxis nearby. I love France and have visited seven, yes 7, times! You are so lucky to be touring and tasting at such a respected winery! I’m following you on your amazing tour of the region.